Years before we even thought about having kids my wife and I had chartered a 50’ catamaran with another couple for a week of cruising and scuba diving through the British Virgin Islands. Among the many highlights was an afternoon at a natural wonder called “The Baths” in Virgin Gorda. We told ourselves that we’d like to spend more time there, and 10 years later we rented a Wimco villa on Virgin Gorda so we could visit the Baths again. That wasn’t the only thing that drew us to that island, we were looking for a low key, laid back island, undeveloped and authentic destination to explore with the kids. We flew in to San Juan, then took a small plane flown by Air Sunshine over to Virgin Gorda. That flight path took us along the length of the Virgin Islands, a spectacular sight from the air. We taxied to a stop in front of the “arrivals terminal”, a small two room building with nothing more than an officer at a desk stamping passports. Wimco’s local rep, a British expat named Sue, met us there and drove us a quarter mile to the car rental office. We got a sturdy 4 door SUV and set off after her to our villa. 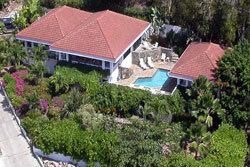 We arranged to stay at Villa VG COO, in the Mahoe Bay area. The photos on the website led us to believe that we’d be staying in a simple 3 bedroom hillside villa with distant ocean views, and access to a small beach. We were stunned to find that VG COO was a modern and spacious villa, with a huge pool, with a sweeping view of Tortola and other islands in the BVIs. The beach at Mahoe bay, which was a 60 second walk from our villa, was over half a mile long and was shared by a dozen private villas, with not a hotel or beach bar in sight. An incredible coral forest lay just off shore, and it wasn’t unusual for us to see one or more sea turtles within minutes of stepping into the water. So, the villa and its surroundings exceeded expectations, now, would The Baths measure up after all these years? On day two of our vacation we drove to the far western tip of the island to find out. You access The Baths, a national park, via a gently sloping quarter mile dirt path from a parking lot. As you descend towards the beach through a narrow V shaped valley you start to encounter huge house sized boulders on both sides. The path winds through, around and under them, and then delivers you onto a magical beach dominated by huge piles of boulders, creating private coves, caverns, secret beaches and excellent snorkeling. The four of us spent hours that first day exploring the area at the end of the path, both on foot along the well marked trail in and around the boulders, and in the water. I can’t describe how special a snorkeling area The Baths are, one swims between boulders to tiny beaches in water two feet deep, then passes into a chamber with views between boulders down into waters over 100’ deep. This maze provides excellent shelter for fish, and we saw all types.